Teens, you can’t understand what it’s like to have a kid with type 1 diabetes. You probably don’t understand what it’s like to have a kid in the first place. If you’ve never had to be responsible for someone the way your parents are responsible for you, it can be hard to really understand how they feel. Try to remember that your parents love you and are worried about your health and safety. They’re terrified that you’ll go low in the middle of the night and they won’t be able to wake you up. Their lives would never be the same if they lost you. And they would feel like they failed and would never get over it. That’s a big reason why they get on your case about your diabetes: they love you and want you to be safe. But, don’t take our word for it, ask them to tell you how T1D affects them. Parents, despite what you may think, you don’t remember what it’s like to be a teenager. Not really. Because being in the middle of it is a lot different than thinking about it after all those problems are in the past. It doesn’t feel the same now. Remember your teen has other important things going on and would probably much rather do literally anything else besides having to think about diabetes. Most importantly, if you don’t have T1D, you don’t really know what it’s like. But, don’t take our word for it. Ask them to tell you how T1D affects them. And keep in mind that we’re all guilty of the whole ‘do as I say, not as I do’ thing. We take risks with our own health and safety. Sometimes we eat trash food or jay walk or stay up too late or ignore posted safety warnings or make decisions without thinking them through. But if someone we love is taking unhealthy risks, we worry about them and tell them to cut it out. Because we’re riskier with our own lives than we are with the lives of those we care about. Parents, your teen may slack off in the same way we all do with taking care of ourselves. It’s really hard to be on your game 100% of the time and, really, even if you do everything right, diabetes is still going to trip you up. Cut your teen some slack. Teens, your parents really are expecting more of you than they do of anyone else, including themselves. Because they love you more than anyone else (including themselves). Cut your parents some slack. 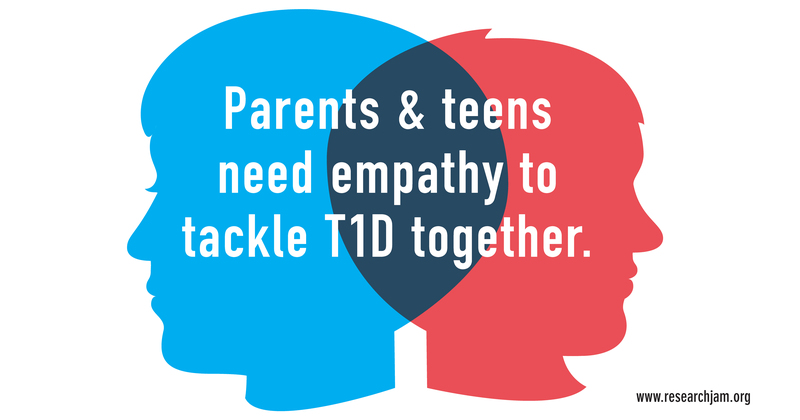 We’re working on creating a tool to help teens with T1D and their parents empathize with each other. Sign up for our email newsletter for updates on this. No one likes to be told what to do. 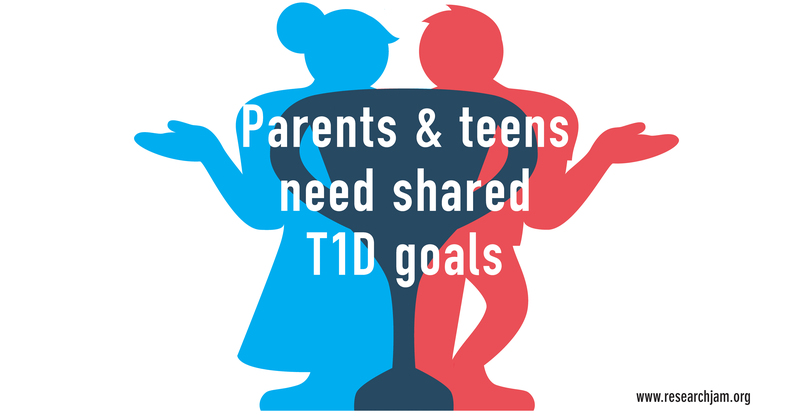 Parents, let your teen set their own goals for T1D management and for your team management relationship. Even if it’s something small to start with. For example, maybe your teen wants to go on that weekend youth group camping trip, but promises to inform the camp leaders about her T1D. Teens, T1D affects your parents too. Let them weigh in on how they want to work with you to help you reach your goals and on what goals they’d like the two of you to reach. For example, maybe your dad would like to get your CGM data on his phone and, in return, will agree to listen without blame when your blood sugars are high. Talk about how you can help each other reach your goals. Make some goals as a pair. Maybe spend some time together not doing diabetes stuff. The point is, have a plan that everyone can agree on and update it as life changes. Turns out, every family is different and there isn’t one magic tool that’ll work for everyone (we’re keeping those mind-blowing revelations going, huh?). In a recent study, our friend Tamara Hannon tested two things (1) a paper contract and (2) a blood glucose meter that shared results among patients, parents, and providers and allowed for text messaging. They both had upsides and downsides. The contract forced teens and their parents to talk to each other about their teamwork in T1D management (which is a good thing), but it caused some conflict (because it forced them to talk to each other about their teamwork in T1D management). The meter was nice because it let providers and parents see blood sugar numbers, but it didn’t really help teens and parents avoid conflict the way parents thought it might. You have to try out different things and find what tools work best for you. One of these tools is your endocrinologist. He or she can help you a lot with your management and give you advice about how to work together. But, don’t rely on your endo to put together your teamwork plan or resolve conflicts. Your doctor can’t be there when your mom texts you for the sixth time that day about your blood sugar and you’re about to send her this. Sorry, but your endo probably can’t get your parents to lighten up. Your doctor also can’t be there when your teen forgets to test at lunch for the third day in a row and it’s all you can do not to leave a passive aggressive note in his lunch bag. Your endo is not going to be able to convince your teen to cooperate with only a 15 minute face-to-face every three months. You have to work these things out on your own. The good news is that there are a lot of tools out there that might help you work better together. There’s technology for sharing your CGM data—like Nightscout or the Dexcom share app—so your dad can obsess over your numbers without you ever having to lift a finger. Or text messaging so you can find out quickly if your daughter brought her insulin with her to that party or let your mom know you already corrected the low she might be seeing on her phone right now. You could make texting a little less labor-intensive with Diabetemojis. Or you could go old school and make a paper contract like the one in Dr. Hannon’s study (“Mom, please sign here to agree that you’ll quit telling everyone I have diabetes.”). Or you can come up with your own tools that work for you, but remember, (1) it will take time and lots of joint effort to find things that work and (2) nothing will work unless you both actually use it. 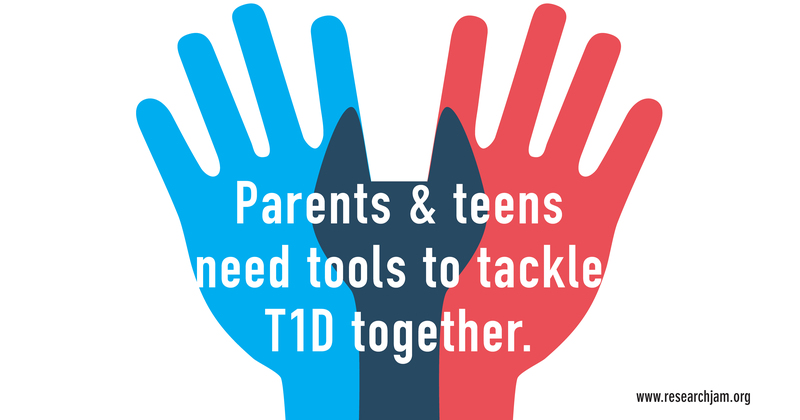 These are just some ideas we had based on what we’ve heard from teens with T1D and their parents in our work so far, but we have a lot of learning to do. We’d love to hear from those of you out there doing this every day. Please comment. Teach us your ways. Research Jam and Dr. Tamara Hannon would like to thank the following people for their help with this work: The patients and families for inspiring us and for sharing their experiences and insights throughout this project, The Agency for Healthcare Research and Quality (5R24HS022434) for funding this work, and Dr. Aaron Carroll for his guidance and leadership.